At the end of June, Rory's office forwarded a telefax including various news, particularly those about the planned festival gigs of this summer. The most suitable occasion seemed to be the one on the 19th of August near Hanover. Then I changed my mind.... a week before the two show dates in South England, I suddenly felt like getting a ticket to London. I was joined by the guitarist of the Swiss band Container (Lou Martin plays the piano on two tracks of their first album) and a colleague. I was really looking forward to these gigs because I hadn't been to a Rory concert since December '87. Ever since I became his fan, there hadn't been such a long lapse. How did it go then? The night before the concert date we had fixed a meeting with Lou Martin in a snug pub in West London. Lou told us the details about the festival. He said that 3 or 4 (unknown) bands were going to play, but Rory's name had not been mentioned; instead they were just talking about a "very special guest". The reason why it was kept a secret was that the 3-day-biker-festival had been organized by the Hells Angels from Kent, who didn't want anybody to go there just because of a star attraction. There was only one somewhat famous band - The Wild Angels, friends of Lou's, who had made a few sessions with the oldie-band Dowliner Sec (Lou had played with them on some recordings). Therefore we were (falsely) expecting 2 or 3000 people at the most. Quite wrong: in the village next to the festival venue, we were told that there were actually ten thousand people. Still, we thought they were exaggerating. So it was quite a surprise when we arrived. It must have been between 30 and 50,000 people, hardly anyone without a bike, a tremendous number of Hell's Angels Club members, other clubs, as well as bikers without a membership. Just after midnight, when the sound of the last band was fading, the tension was becoming almost unbearable. The organizers still hadn't let the cat out of the bag and said that Rory was their ‘special guest’. Eventually, Rory was announced as the most suitable musician to be the highlight at a biker festival. Enthusiastic applause by the audience followed, although the preceded programme and the alcohol had almost fagged them out. It was a special event for me to see Rory live in such an unusual environment and after a gap of 1 1/2 years. He played many of his favourites, but there weren't any new tracks in his set. The 3rd or 4th song was a new fantastic blues, which wasn't really new, as it turned out later on. In fact, it was an old Muddy Waters song. All in all it was a fine standard set, however it lacked the usual highlights, probably because it was pretty late and the audience too tired to turn RORY on. So there were no extraordinary extras. The set was well done, but it was certainly not one of the outstanding gigs which I will never forget. I also think the band lacked the usual motivation because firstly the set lasted only 90 minutes, secondly, after only one acoustic song, (Out on the Western Plain), Rory already picked up the electric guitar again and, thirdly, there was only one encore. To cut it short, this show wasn't spectacular. However, thanks to the unusual atmosphere, I will remember it anyway. After the show I had a few minutes to talk to Rory in the dressing room. He wasn't really talkative and seemed to be looking forward to his hotel room bed. The next concert venue wasn't out of reach at all, cause it is just 15 miles from Lydd to Folkestone, which is famous for its seaside. Rory had been there last year in the autumn during his tour through England. It seems that the organizers had been quite enthusiastic about his show, so that they had booked him again this year for the Summer Jazz & Blues Festival, which starts at the beginning of July and lasts all through the month. There are only two groups, at the most, performing each night, e.g. SteveMarriott or the Indestructible Blues Band, however, there are mainly jazz musicians, such as Dizzy Gillespie, Chris Barber, etc. The big concerts took place in the very beautiful Leas Cliff Hall, which, I guess can take up about 1500-2000 people. That night was supposed to be something special, Mike Hirsh (drums- Mick Clarke Band) and Mick Clarke himself joined by his girl-friend who had come from London. Mick Clarke, who is a legend in the English blues/rock scene hadn't seen Rory live for over 11 years. Last, but not least, there was Lou Martin, believe it of not........he hadn't seen Rory since their split in 1978, which also makes 11 years. Before the show started, Clarke, his girl friend Linda, Mike Hirsh, Lou Martin, Container-guitarist Manuel Bosch, and my humble self met in a bar near the hall. Some time later, Gerry MacAvoy, Brendan O'Neil, Mark Feltham and one of the technicians turned up too. We had lots of things to talk about because the guys of the Rory Gallagher Band and Mick Clarke Band have been friends for many years (Mark Feltham had joined the Mick Clarke Band on two LP's - Rock Me and All These Blues). At 9 o'clock we went in different directions - Gerry, Brendan and Mark headed for the dressing rooms, whereas the rest of us got inside the hall. Now, I was getting more and more excited. It was certainly going to be a terrific concert because there were fans from all sides of England, some French guys, Marc Nouve and Donnie Decreamer, joined by their wives, had come from Belgium, and last but not least, Switzerland was present, too. There was no doubt - this night was RORY's night. Just after 9 0' clock they hit the stage. Kicking off with The Loop, they got everybody on their feet. Following The Loop was a well-mixed pot-pourri through Rory's works, from 1972 until today. Picking out this or that song would be unfair, it all sounded incredibly compact. One of the highlights was just fading, but you wouldn't have time to take a breath until the next one followed. It seemed that the surprising specials which were generally missing the night before wouldn't ever stop. In fact this gig was so exciting that I cannot even remember any details. Besides Rory was giving his band much more scope than in Lydd, which made the guys react by playing several brilliant solos. For one thing, the band were enjoying themselves more than the night before; secondly Rory had swopped a few songs. As far as the music and the improvisation work is concerned, the show was brilliant. The songs, often turned into real jam sessions although it all sounded as if it had been rehearsed many times. In my opinion, THE highlight was an instrumental which developed from one of these impromptu pieces. You'd think it had been part of their set for the last 20 years. I have never heard Rory play this song before, so that it even seemed a bit weird to me (for its quality). Unfortunately, I haven't found out yet the title of this song. Lou Martin thought it might be on the Junior Wells/Buddy Guy album, Hoodoo Man. Messin' with the Kid had a fulminating finish. Bullfrog Blues surprised with an unusual opening. Unfortunately, it was much too early, although they had played their usual 2-hour set. After the concert we met for a nice chat. The way Rory and Mick said hello showed that they have known each other for a long time. It seemed that Rory was quite delighted that Lou Martin, his former long-time musician came to see him live after more than a decade. During the show, after the 4th or 5th song Rory had welcomed us with the words: "We have some good friends here, Lou Martin, Mister Mick Clarke, some friends from Belgium, and Markus from Switzerland". It may be childish, but it really was something special to me to hear him mention my name. After the concert, Rory was in such a good mood as I have hardly ever seen him. Of course he was talking shop with Clarke at first, then he knew lots of jokes about other musicians; he also was definitely looking forward to the first album of the Swiss band, Container, with Lou Martin as guest musician. Manuel Bosch, guitarist and boss of the Containers, got quite excited when Rory, who was looking at the information on the cover, tried to read out one of the titles, which is called MINA ZEBA ISCH IM EIMER (My toe is ruined) - their songs are written in Swiss dialect. It almost seemed to be too much for Manuel, who had been to a Rory concert for the first time and actually met him in person too. What was inevitable - after a series of other jokes by Rory and some stories of the Lou Martin period - was to say good-bye. There was only one thing which could have made this night absolutely perfect, that is a live session with Mick Clarke. As far as I know, there was only once such a session. 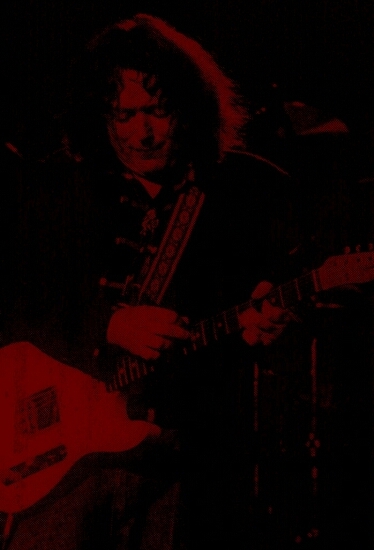 During a show in 1978 or '79, Rory suddenly came up on stage to join the Ramrod (former band of Clarke/Martin/De'Ath etc.). It would be nice to see more of it. At least as far as I am concerned it would be THE event to see my two favourite guitarists on stage to play together. The final comment on the concert should be left to Mick Clarke, who I have a great respect for both as a person, and the musician. "The last time I saw Rory was in 1978 with Lou Martin, Rod De'Ath and Gerry MacAvoy. I could hardly believe it, but Rory and his band have become even better. It was the best concert I have seen for a very long time."